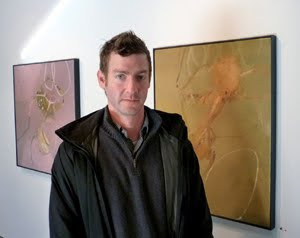 Painter Tommy Taylor in a Q + A with Whitespace gallery director, Susan Bridges. SB: When did you first realize you wanted to be an artist? Taylor: I decided at a young age to be an artist. It really was what I always did best and defined who I was as a youth. I remember being very young and thinking how strange it was that I knew what a tiger or a lion looked like in my head, yet I could not draw one that looked lifelike…so I got a book on how to draw animals and off I was! SB: What inspires you to paint? Taylor: Life inspires me to paint. Pain, joy, bliss…Music is inspirational and other artists work inspire me. SB: What famous artists have influenced your work? Taylor: Early inspiration was Andrew Wyeth. Later Willem de Kooning, Richard Diebenkorn, Antoni Tàpies, Inka Essenhigh, TL Lange. SB: Do you feel your academic training prepared you for a career as an artist? SB: What do you do for fun, besides paint? Taylor: Fun? I like to see movies like everyone I suppose. I like to get crazy and sing Karaoke. But my favorite is surfing. We used to surf in NYC at Rockaway Beach in the shadow of the projects. Picked it up while traveling. I’m not very good but love it. I’m a longboarder. SB: My favorite painting in your show is Bicycle Thief, which is your favorite and why? Taylor: Next? Hopefully that show in Asia. Maybe travel to Indonesia and ride out the recession on a beach…surfin’ and painting! This entry was posted in Interview, Tommy Taylor on February 1, 2010 by Whitespace.